Are You Jellin’? ← You Want Me To Wear What? As evidenced by earlier posts, I’m more than happy to talk about my own fashion past, especially if it’s 90s related. 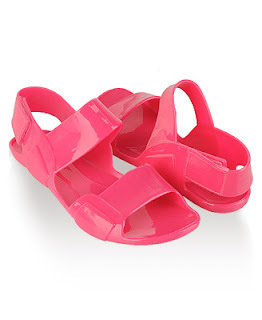 So it is without shame that I admit that yes, I totally owned a pair of jellies back when I was 6 or 7. I begged my mom to buy them for me, she reluctantly agreed, and I wore them until they fell apart, despite the fact that they gave me terrible blisters. Because, as far as I was concerned, they were the coolest, chicest thing ever. I don’t really have a problem with their resurgence. I’m now an adult and I know better than to buy jellies, so the trend doesn’t really affect me much. It mostly just makes me nostalgic for the days when I still thought that my jellies and bike shorts were a combination the likes of which hadn’t been seen since some guy got chocolate in another dude’s peanut butter. Oh my god, these are totally orthopedic jellies, and that’s just sullying the good name of all that six year old Amanda holds dear. These are not okay, Forever 21. These are not okay at all.